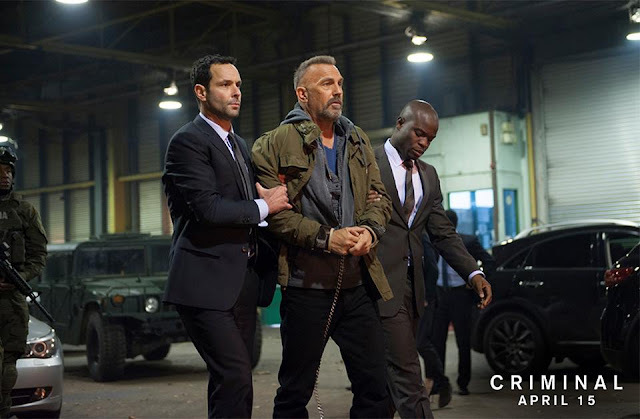 Kevin Costner stars as "Jerico" in Criminal. Photo credit: Jack English. © 2016 Summit Entertainment, LLC. / Lions Gate Films Inc. All Rights Reserved. Kevin Costner stars in this action adventure film. In order to stop a terrorist, the memories, secrets and skills of a dead CIA operative are implanted into the brain of an unpredictable and dangerous death-row inmate. Will he be able to complete the mission? © 2016 Summit Entertainment, LLC. / Lions Gate Films Inc. All Rights Reserved.